At the recent ALIVE Awards Ceremony 2018, thirty students received their President’s Award for Volunteering Certificate from St. Angela’s College President Dr Anne Taheny. ALIVE (A Learning Initiative and the Volunteering Experience) is the NUI Galway and St. Angela’s College President’s Award for Volunteering. It is awarded to students in recognition of their volunteering in their home or college community, and acknowledges the learning experience that comes from spending time volunteering. In addition to giving their time to build and strengthen communities through volunteering work, each student also reflects on that experience through the completion of an online reflective portfolio. 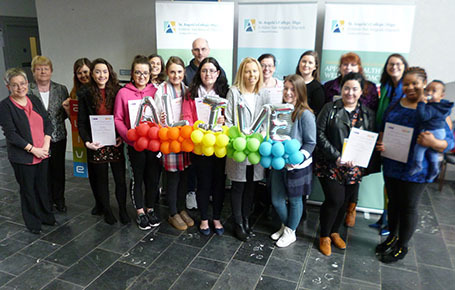 Una Roberts, Student Services Officer and coordinator of the ALIVE programme at St. Angela’s College congratulated students on their awards and highlighted the importance of volunteering work by giving time, energy and expertise to the College community or the wider community of Sligo or elsewhere. The award ceremony was further attended by Lorraine Tansey, Student Volunteer Coordinator of the Community Knowledge Initiative (CKI) at the Institute for Lifecourse and Society NUI Galway and Aoife Deasy, St. Angela’s College Student Union President. Student ambassador Amy O’Connell spoke about her rewarding experience of volunteering. President Dr Taheny concluded that ‘volunteering gives you the opportunity to broaden your experience and learn new skills as well as taking on responsibilities and developing insights in to the lives of others. Volunteering increases your confidence and feelings of self-worth.